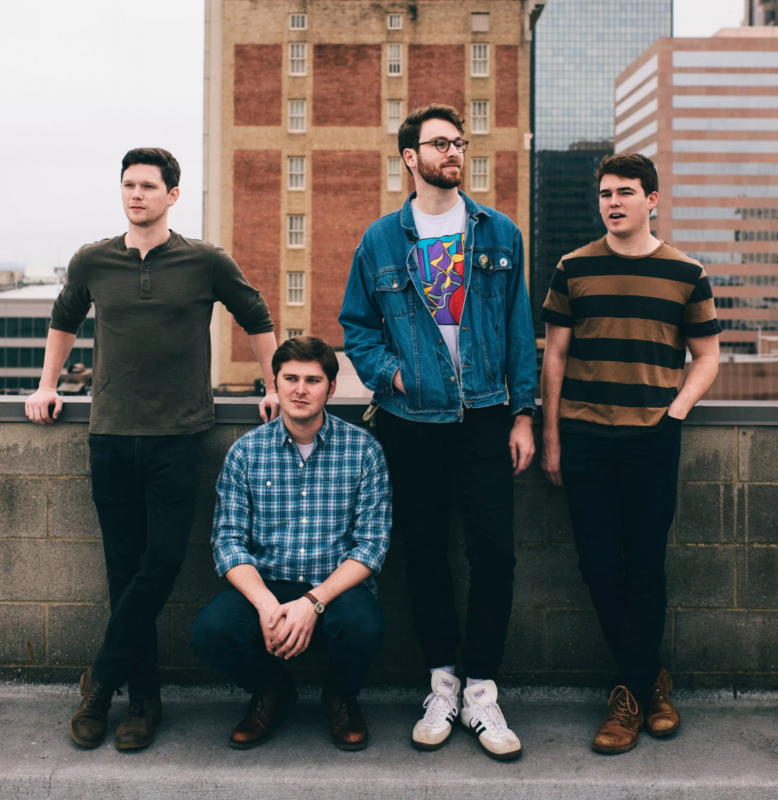 Assistant arts & culture editor Eliza Noe sat down with The Brook & The Bluff, a four-man band born and bred in Birmingham, Alabama, ahead of their show at Proud Larry’s last night. Packed into a van — they’re still debating its name, narrowing it down to either Vannabelle or Vincent Van Gogh — bassist Fred Lankford, vocalist Joseph Settine, guitarist Alec Bolton and drummer John Canada have been touring the South before starting their national tour with the band Ripe in early 2019. In the interview, the band members talked about their move to Nashville, their inspirations and how they identify themselves. The quartet also opened up about their lives on the road, making inside jokes about things like Huel, a nutritional powdered food they eat when they don’t want to stop for food, and discussing their favorite tour stops. Eliza Noe: What has been the biggest difference between the Birmingham scene and the Nashville scene? Fred Lankford: It’s a lot bigger to start with. There’s a lot more going down in Nashville. I think the misconception is that Nashville is mostly country, but there’s a lot more rock and roll. Joseph Settine: There’s a lot of everything. Alec Bolton: Just the existence of a music industry, in general. Birmingham has a lot of good music and good musicians, but the music industry itself is not there — as far as management agencies or booking agencies, that kind of stuff. In Nashville, you’re surrounded by musicians everywhere. It’s awesome because you can collaborate and get advice from anybody. John Canada: There’s more of a music community whereas in birmingham, all of our friends are working nine-to-five jobs. We were practicing in the morning and teaching lessons in the afternoon so it’s just a little different, but in Nashville, there are people who are on your exact same schedule, which is so great. It’s a great place to be. EN: Who are some of your musical influences? JS: For me, it’s Frank Ocean. He’s just the greatest artist ever. Everything he does is perfect. He’s the best songwriter around right now. JC: I can’t disagree. I don’t love him in the same way Joseph does, but I do appreciate what he does. With everything we’ve listened to in the car, I probably wouldn’t have gotten into Frank Ocean so much if Joseph hadn’t played him so much. FL: We also like Kacey Musgraves. “Golden Hour,” specifically. JS: We all do. We like John Mayer, too. Radiohead. Coldplay. JC: We’re trying to make an album that sounds right between “Golden Hour” and “Continuum” (by Mayer). FL: We’ve also been rocking the “Dear Evan Hansen” soundtrack. EN: What is your songwriting process like, from inspiration to the final product? FL: It generally starts with Joseph and Alec. JS: I guess it’s personal. I write most of the lyrics, so they’re all personal. They’re from things I have gone through. The thing we’re writing now is from a trip to Europe I did a couple of years ago, and it’s just kind of focused on the things that happened on and around that trip that have affected me since then. JS: One of my favorite songwriters is John Prine. He said something like, his best songs are already out there, you just have to be willing to accept it, if that makes sense. You have to be open to it because the song’s already out there. … It’s a muddy picture that you have to make a clearer image. EN: What’s your favorite song to perform live? JS: Favorite original right now is a new song we’re working on — we just finished it literally last week — and it’s called “Off the Lawn.” It’s just the best. It reminds me of the couple of times I’ve been to New York and just walking down the street. You can put it on and just, like, bop around. I think we may have different favorite original covers. JC: Maybe “Corduroy Dreams” by Rex Orange County. I think that’s probably all of our favorite at the moment. AB: Recently, we’ve played “Wait for the Moment” by Vulfpeck, which is really fun. Only when we have a keyboard player, though. FL: I think my favorite original song is called “Calling Hearts” because we just added a little instrumental breakdown that’s really fun to groove around and get funky with. EN: If you could describe yourselves in three words, what would they be?